Couscous is very versatile. Not only is it a great side, it makes a great breakfast too, an exotic form of cream of wheat if you will. Try this one cold morning for a taste of sunshine. Use whatever nuts or dried fruit you have around, these are just some of my favorites. If you are on a bland diet, you may want skip the dried fruit and nuts and stir in a little applesauce or poached pears instead. 1.In a microwave proof bowl, combine the milk with cinnamon, honey, ground ginger, and cardamom. Cover and microwave for 2 minutes, until the milk is very warm and steaming. 2. Remove the bowl from the microwave. Remove the cardamom pods and stir in the couscous. Cover and let sit for 3-5 minutes, or until the milk has been absorbed. 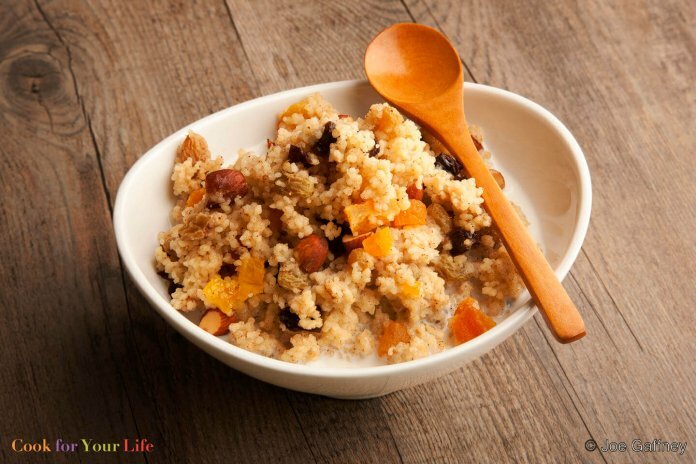 Stir in chopped almonds and dried fruit. If you do not usually cook with a microwave, simmer the milk with the spices in a small saucepan over medium-low heat for about 4 minutes. Use regular couscous if you are on a bland or low fiber diet.